Not even six WBS Penguins goals, including Mark Letestu’s first professional hat trick, were enough for the Penguins to defeat the Hershey Bears. WBS came within one goal in the third period but with 1:06 to go, Boyd Kane scored a shorthanded goal as Brad Thiessen was being pulled for an extra attacker to claim an 8-6 victory for Hershey. Tim Wallace scored the opening goal 45 seconds into the game, but the lead did not last for long as Alex Giroux answered back just 19 seconds later. Letestu scored his first of the night to put the Penguins in front 2-1, but by the end of the period; Oskar Osala, Boyd Kane, and Alex Giroux had answered back to give the visitors a 4-2 lead after the first. Wallace got his second of the night and Luca Caputi chipped in to make the score 7-6 but the Bears weren’t going to let up. In his first start since coming back from Pittsburgh, John Curry was pulled in the second period after allowing seven goals on 20 shots. Thiessen came in and allowed only one goal the rest of the way, and that was Kane’s shorthanded tally at the end of the game. With the loss, WBS falls to 21-22-1-1. They are in fifth place in the East Division and dangerously close to being in last place. Joe Vitale took a puck to the foot in the morning skate and did not play last night. Adam Berkhoel was sent to Wheeling earlier in the day. Letestu was credited with the hat trick on a scoring change announced in the beginning of the third period. The start of the third was briefly delayed as a few fans threw their hats on to the ice. Hershey captain Bryan Helmer now has 500 AHL points for his career after tallying two assists last night. Due to Manitoba being in town for back to back games this weekend, only one pregame will be written for the matchups. The Penguins traveled to Manitoba back in October for a two game set on October 29th and 30th. The teams split the set with WBS earning a 1-0 overtime win on the 29th with Ryan Bayda scoring the game’s only goal. The next night, the Moose answered back with a 2-1 win in a shootout. 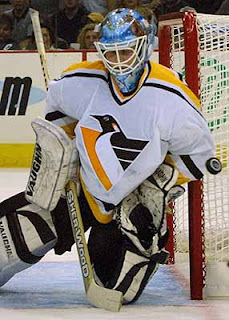 The 1-0 win marked Curry’s first shutout of the season and in spite of the loss the next night, Dustin Jeffrey was a bright spot for the Penguins when he scored the second penalty shot goal in team history (the great Rico Fata was the first. You loved him. Admit it.). Yeah this one. Apologies to all Johan Hedberg fans who were hoping I'd take you down memory lane. The Moose, who are the defending Western Conference champions, are currently on a six game losing streak; with their latest loss coming last night in Worcester by a score of 5-3. Their record is currently 23-21-4-1 for third place in the North Division. One of their biggest weaknesses is their power play, which is ranked 28th in the AHL at a 12.7% success rate. The Moose currently have two players down from the Vancouver Canucks for injury rehabilitation. Michael Grabner played two full seasons with the Moose in 2007-2008 and 2008-2009 with two 40+ point seasons. This season he has five points in nine games with the Canucks and 13 points in 19 games with Manitoba. He has only played 28 games this season due to a foot injury sustained in a pre-game soccer match. Jannik Hansen has played 24 games with Vancouver this season and has nine points. He has spent his whole career up and down between Vancouver and Manitoba. He joins Manitoba while recovering from a hand injury. Thanks to Pens/Canucks/Moose super fan @kimberlyann32 for the information on Grabner and Hansen. First year pro Sergei Shirokov is fifth in the AHL in rookie scoring with 14 goals and 17 assists. In the Pens’ loss to Manitoba back in October, he scored a power play goal during regulation and then scored the winning shootout goal. Goaltender Cory Schneider is fourth in the AHL with 19 wins this season. He has a 2.60 GAA and a .913 save percentage.